Powerful HG2 Batteries have 3000 mah and will last you hours while vaping. The battery uses high technology, including 3.3V constant voltage output, protections against short circuit, protection against over-charging and discharging, and ensures continuous working of the battery. 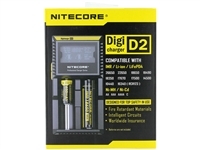 Introducing the D2 Digicharger from Nitecore, a two-bay, two channel battery charger. The sleek and informative charger is compatible with a wide array of battery sizes and chemistry. Capable of charging two batteries simultaneously, ranging from Lithium-Ion, LiFePO4, to NiMh, and NiCd chemistry, you don't have to worry, as the D2 Digicharger automatically detects the battery type and status before entering automatic charge mode (CC, CV, dV/dt). The D2 Digicharger also automatically detects battery power status and selects the appropriate voltage and charge mode, with the exception of LiFePO4. You will have to manually select LiFePO4. Also, gone are the days where you have to sit around and wait for the battery to finish charging, as an automatic power-off function will cut off the current when charging is complete.